Welcome to the beautiful and amazing fresh air of the Sierra National forest amongst 100 and 200 foot cedar and pine trees in this 2100Sq. Foot, 3 story cabin with HOT TUB. (My name is Tony (818*681*8049) call or text me with any questions :) Also see our newly listed sister property in Sugar Pine on the same road 7 cabins away VRBO # 1146799 it is also amazing ) We are located in the beautiful and enchanting community of Sugar Pine just below Fish Camp on the way to Yosemite. It was part of the historic Madera Sugar Pine Lumber Company, the largest, most successful lumber operation in the west. This serene cabin is the last house on the end of a road, facing the forest and nestled in the tall beautiful Pine, Cedar and Fir trees. A large deck faces the forest with a comfortable seating area and gas fire pit that provide s the perfect ambience for a dinner on the deck or just to relax among the tall trees and enjoy the peace, quiet and forest scents. A 2018 jacuzzi brand 7 person hot tub is available on the back patio upon request :) The cabin is located 8 miles north of Oakhurst off of highway 41, just 7 miles from the southern entrance of Yosemite National Park and 20 minutes to Bass Lake. The upstairs master bedroom is surrounded by windows with views of the pines. You will enjoy a King Bed, skylights, a private 3/4 bath., a wall mounted TV and a wood burning stove. The master is complemented with a private romantic deck and features a comfortable sectional couch, bistro table and gas fire pit. The main floor offers a fully stocked kitchen with dinnerware, appliances, and all the amenities needed. The dining area has a round/expandable table, breakfast bar and wood burning stove. The living room has a large sectional sofa with 2 built in recliners, plus one additional separate recliner, and a 65 inch television. A full bathroom with granite counter and vessel sinks is a few steps up from the dining area. Full indoor laundry room is also a few step up from the dining area. The bottom floor offers 2 bedrooms with queen beds, one with an additional loft great for kids with its own TV. A bonus room offering an 8ft wide projection Home theater with awesome surround sound, PS4 gaming system and a Queen sofa bed. All TVs offer Dish TV with all the movie, sports and on demand channels, Wifi, and wifi calling are included. Local calls only can be made on the cabin land line. Old historic Lewis Creek runs nearby, and the entrance to the famous Lewis Creek hike is just below the cabin on Road 630. The Lewis Creek hike boasts 2 very unique waterfalls, Red Rock and Corilieu Falls. Oringally, this creek was used to provide water to the 56 mile flume that took the cut lumber down to Madera during the production years of the lumbar company (1898-1931). The property is only 1 mile off highway 41. The owners have pets but a deep cleaning is performed prior to renting and no pets are allowed during the entire rental season to ensure a clean and allergy free environment. NO PETS Allowed please. This is our first time listing property. We are in the process of fine tuning the details. Please call us to get the most information. We hope you will enjoy your stay at our home. We will offer Discounts for last minute booking if we have availability. We will treat all our guest like family and friends :). We need to inform you that we have a dog that comes to this property in the case of a guest that has allergies. However, our home is very clean and you would not notice a dog. Located in the quaint and historic community of Sugar Pine and 7 miles to Yosemite southern gate. 20 minutes to Bass Lake and 12 minute to oakhurst where you will find most everything you will need for supplies. toilet, combination tub/shower, Granite counter top, vessle sinks. Forced air heating on main floor and master bedroom. Baseboard heating on lower floor. The heating system works great and it is easy to make cabin comfortable. It is only needed in spring and fall. 2 Wood stoves. One on main floor and one in master bedroom. Large sectional sofa with 2 recliners, and one additional recliner. 65 inch tv. LOWER LEVEL has an additional living area with 9ft wide HOME THEATER screen with DISH TV & gaming system. sweet !!! Round Table with seating for 6, expands to sit 8. Breakfast bar seats an additional 4. Brand new jacuzzi brand hot tub seats 7. Installed August 5,2018. Available on request. Locked for child safety. user must Use at your own risk. Fishing, hiking, boating, Atv off road trails near by. Great cabin for couples or families! The cabin was great! Very clean, warm, close to Yosemite Park. Hot Tub was perfect! Wonderful place. Owners were awesome. We had a fabulous time at Yosemite. Hope to come back sometime. We loved staying here! 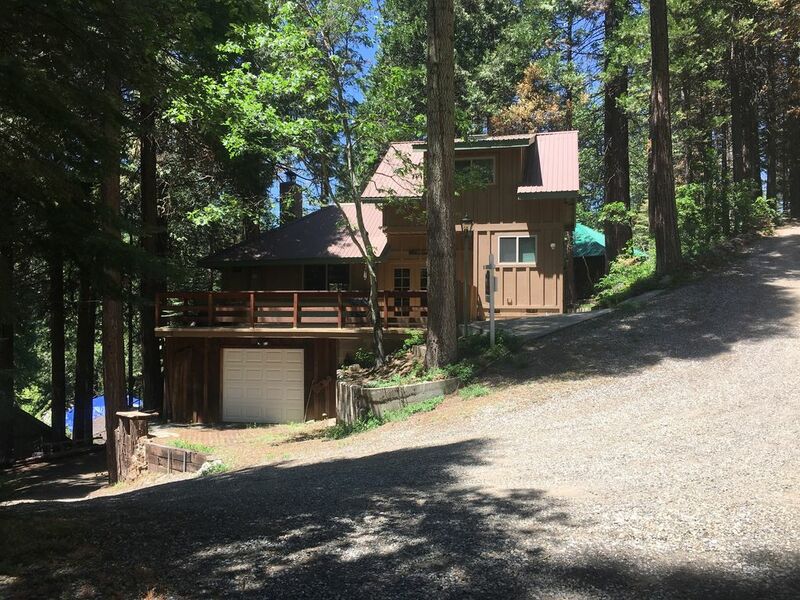 Convenient location close to Yosemite and the town of Oakhurst. Lots of room and comfy beds. Good communication from Tony and Sara. We couldn’t have asked for a better place for our trip! This was a hidden gem! Super convenient location and well appointed cabin. Sara and Tony were wonderful hosts too. Thank you! First off, Tony and Sara were absolutely wonderful. They treated us as if we were family. Tony worked with me and was exceptionally accommodating to some last minute request I made, he went the extra mile to make sure we were happy. Then there's the cabin itself. All the adults and the kids loved it! It is just a great place to bring the family. We all agreed we need to come and stay here again. We really love sharing the cabin with people who appreciate the place. So happy it all worked out for your trip and would love to host you and your family anytime. Thank you again for choosing our place. -Bass Lake is about a 20 minute drive. Water temperature is very warm in the summer. -A casino is about a 35 minute drive. -Sugar Pine Railroad is 3 miles away and has daily rides. You can hear the whistle from the cabin. -Miami Trails OHV area is 1 mile away. -Lewis Creek trail has an entrance in Sugar Pine below cabin. - Take Sugar Pine Rd to Nelder Grove, a Jeep trail entrance in Sugar Pine near the cabin. You can ride to the Giant Redwood Trees with a 4x4 offroad vehicle.